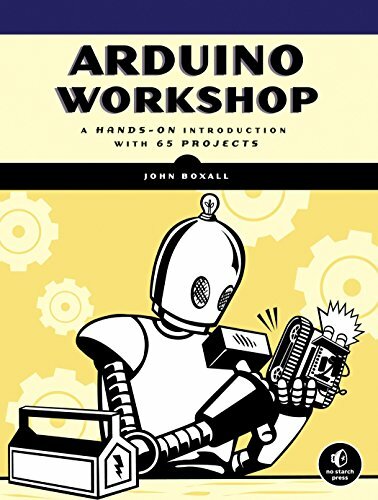 [PDF] Arduino Workshop: A Hands-On Introduction with 65 Projects | Free eBooks Download - EBOOKEE! Description: Learn the Basics, Build the Projects, Create Your Own The Arduino is a cheap, flexible, open source microcontroller platform designed to make it easy for hobbyists to use electronics in homemade projects. With an almost unlimited range of input and output add-ons, sensors, indicators, displays, motors, and more, the Arduino offers you countless ways to create devices that interact with the world around you. In Arduino Workshop, you'll learn how these add-ons work and how to integrate them into your own projects. You'll start off with an overview of the Arduino system but quickly move on to coverage of various electronic components and concepts. Hands-on projects throughout the book reinforce what you've learned and show you how to apply that knowledge. As your understanding grows, the projects increase in complexity and sophistication. Among the book's 65 projects are useful devices like: * A digital thermometer that charts temperature changes on an LCD * A GPS logger that records data from your travels, which can be displayed on Google Maps * A handy tester that lets you check the voltage of any single-cell battery * A keypad-controlled lock that requires a secret code to open You'll also learn to build Arduino toys and games like: * An electronic version of the classic six-sided die * A binary quiz game that challenges your number conversion skills * A motorized remote control tank with collision detection to keep it from crashing Arduino Workshop will teach you the tricks and design principles of a master craftsman. Whatever your skill level, you'll have fun as you learn to harness the power of the Arduino for your own DIY projects. No comments for "[PDF] Arduino Workshop: A Hands-On Introduction with 65 Projects".